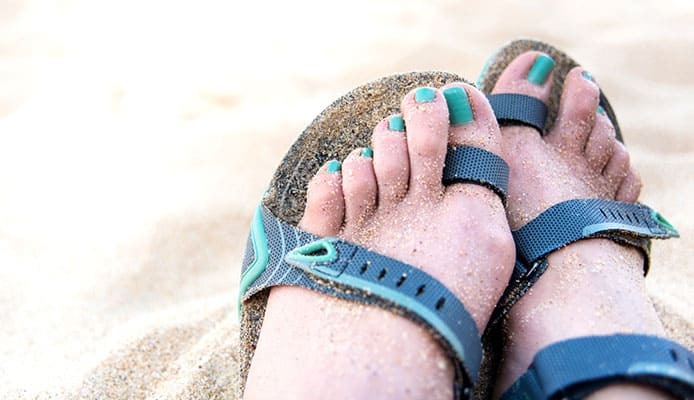 Whether you are planning your next vacation or simply looking for your summer activities, investing in the best water shoes can prove invaluable. Water shoes are commonly used for swimming, paddle boarding, snorkeling and beach activities however their use can go far beyond this. Oftentimes many travelers find value in bringing water shoes along for daily activities or simply as shower shoes. Water shoes will come in handy for those working in wet environments such as at a car wash. Whatever your intended use for these shoes is, it is important to get a high-quality pair that will last you. When working in colder climates, it is recommended you opt for cool water shoes that will better protect you from the harsher temperatures. We have created a general list of the best water shoes on the market. It is clear to see why these shoes topped our list for use from everything from kayaking to hiking. If you haven’t already, check out our list of the best men’s and women’s water shoes for this year. A simple look at these shoes will show you why these are the best water shoes that made it to the top of our list. 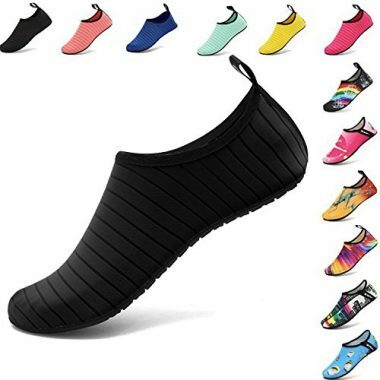 These rubber made water shoes for men come in 27 different colors allowing you to get the perfect shoe to fit your style. These water shoes for beach wear go far beyond a simple swimming shoe. Wear these aqua socks for yoga, dancing, exercising and paddle boarding. The low profile, comfortable design of these shoes doesn’t leave you feeling bulky or weighed down. This allows them to feel more like the best water socks than a heavy weight shoe making it a great option for activities such as yoga. Using only man made materials means that you get top quality at an affordable price. The sole of these shoes has a unique studded style traction texture. These raised bumps act as an anti-slip control even when walking in mud. The sole clings to the surface allowing your feet to stay planted when maneuvering across slippery rocks. It is also fully flexible allowing you to move into different positions and roll up for easy transport. The soft design of the mesh sits comfortably against your foot and conforms to the shape of your foot with ease making them a great option for those with a wider foot. These shoes feature a rubber sole which adds cushion to the shoe. 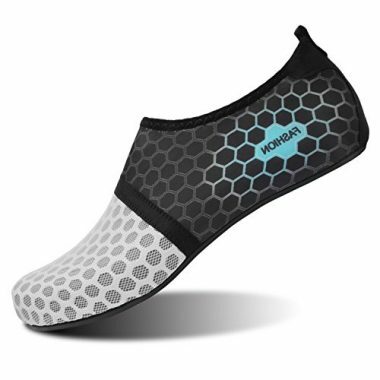 This flexible sole has a smooth neck design prevents chafing when wearing our water shoes. It is convenient to wear and take off. This is the best water shoe which is a great choice for the whole family. This unisex shoe offers sizes and styles for both men and women including half sizes to help ensure you get the perfect fit. 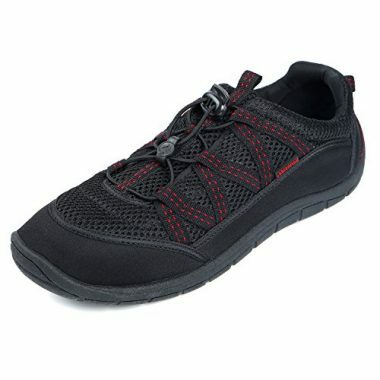 Coming with a transparent zippered bag, these lightweight shoes are a great option for travel. Their incredible lightweight design makes them perfect for all your day excursions from jogging and kayaking to scuba diving and surfing. These top rated water hiking shoes perform in virtually every circumstance. Their 720 degree mesh design leads way to excellent breathability and allows these shoes to dry incredibly quickly. This fast drying feature will positively influence your foot health giving you a cooler and healthier shoe environment. This 3D cycle ventilation system is sure to keep you dry and comfortable. A double padded toe box further protects your feet greatly increasing the lifespan of your shoes. This prevents the common wear of your toes poking through the shoe. 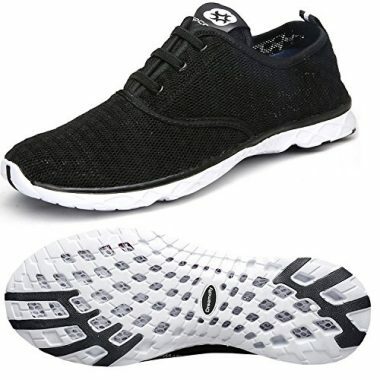 The sole of these shoes differs from your typical shoe as it is lined with a mesh fabric and a holed sole that allows ventilation to continue even through the sole. These drainage holes help water flow freely between inside and outside of the shoe. This works to ensure that your shoes will never be weighed down with excess water inside. This shoe features superior cushioning and shock absorption allowing it to seamlessly transfer between an excellent water shoe to a reliable and supportive hiking shoe. 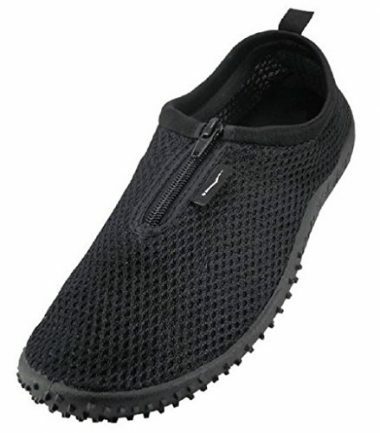 If your wallet has taken a beating yet you still need the best water shoes, take a look at the Aleader Slip on water shoe. The fabric design keeps your foot comfortable and supported while cool and breezy. A rubber sole keeps your foot from sliding around on slippery surfaces. They have been designed with holes in the bottom that allow water to drain as you kick through the water and the second you exit the water. The midsole has been created to be lightweight and flexible enough to bend naturally with your foot. Coming in twelve different color schemes you will be sure to fit into your style. A mesh upper gives you protection from the sun while being breathable enough to ensure your feet don’t sweat. This material will also dry quickly. Quality stitching not only adds durability and fights wear but also adds an added flair to your style. Coming in at only 4 ounces each these shoes are so lightweight they won’t even feel like you’re wearing shoes. Aleader has designed these shoes to stay on your feet. Some water shoes have a tendency to pull off your heel, but not these. Your heel will be suctioned in providing you with worry free walking. 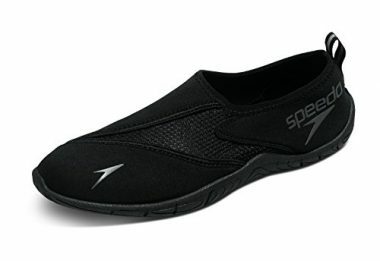 These men’s speedo water shoes are the best water shoes for swimming on the market. The sleek low profile design sits comfortably against your foot without any bulk to reduce drag. Featuring a durable four-way stretch material these shoes are easy to slip on and off while staying firmly on your feet during activity. The mesh upper sole of this shoe allows your foot maximum breathability and allows the shoes to dry quickly. These shoes feel more like the best water socks when on as they have an impressively light weight. The outer sole of this shoe offers a no slip grip achieved with an S-trac design. This enhances surface contact allowing your feet to stay firmly planted even in wet and slippery conditions. An internal cushioned insole provides a great deal of comfort to your stride improving impact resistance and keeping your feet safe and comfortable. These water shoes will take you from your hotel to the ocean and everywhere between making them a great shoe for vacations. The lightweight design can easily fit into your luggage. These can be used as shower shoes when abroad and can help to increase your everyday hygiene. Speedo is the most well known and one of the most reputable swim brand companies in the world. That is why these shoes are made of such high-quality materials and trusted by pro athletes worldwide. These shoes are some of the best water shoes for hiking on the market. Getting a pair of quality water shoes is important but there is real value in buying shoes that transform from the ocean to the mountains with ease. These shoes do just that with their thick rubber sole that is great for the trail. 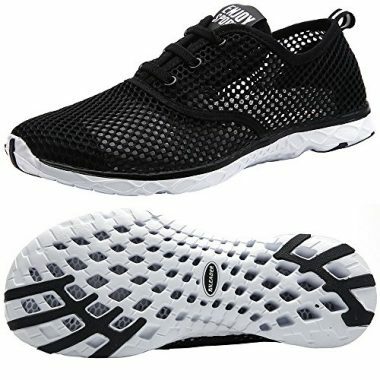 Made using a meshed fabric material, these shoes are incredibly lightweight and excel with breathability. This mesh fully wraps the foot which gives to foot superior drainage allowing water to flow from inside and outside the shoe with ease. This helps to keep the shoe light feeling not allowing it to fill with water. This lightweight fabric also allows the shoes to air dry incredibly quickly increasing your comfort when moving from water to walking. The midsole of this shoe is made using Solyte technology that provides further work to keep this shoe having a minimal and lightweight design. This design features large holes in the shoe seen as air pockets to provide a bounce back cushioning while not adding any weight to the shoe. 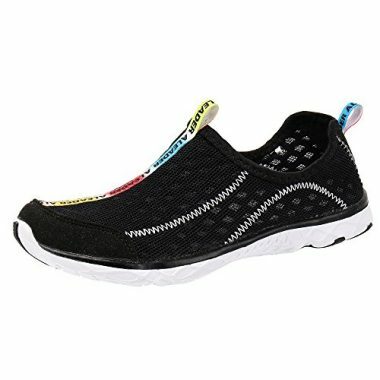 This is an incredibly durable form of comfort cushioning that is incredibly desirable in water shoes. This will work to protect your foot from impact found when walking and hiking. A ComforDry sockliner adds additional cushioning and shock absorption to the shoe. This removable liner works to create a cooler, healthier and drier shoe environment that is highly desirable. A Water Grip outsole is found lining the sole of the shoe providing enhanced traction that performs even in wet and slippery conditions. This allows the shoe to effortlessly grip to the below surface and keeps you standing upright. Working in more than just wet conditions, this outer sole performs well on the trail making them exceptional for muddy trails. These water shoes are great for vacations as they transfer seamlessly between all your day excursion activities. These are the best water shoes that just look mean with their tough grip outer sole. A full stud wraps around the sole and onto the edge of the shoe for even grip that surrounds your full foot no matter how you stand. A higher top shoe, this water boot does have a lower cut design than most others of its kind. The neoprene sock offers a 3 mm thickness and protects water from entering your shoe unlike any other on our list. This neoprene boot is made using wetsuit material to actually insulate your foot making it a great option for colder water use. Rather than just allowing water to freely flow between in and outside of your shoe this boot actually prevents water from entering freely which allows your feet to stay warmer. While these boots don’t transfer between water activities and the grocery store as others do on our list they are one of our favorites. The edge of the shoes rise higher than most water shoes and ensure they stay firmly in place on your feet. Promate has designed yet another high-quality water boot. They weigh slightly more than the other options on our list, but make up for it in the built quality. The seams are meticulously glued for the best protection allowing them to let less water through. These water boots are flexible and form fitting enough to easily fit into fins and can be used for more extreme water sports such as scuba diving. Water shoes don’t always have to look like water shoes. The Adidas Climacool water shoe is a testament to that. A sleek design will keep you looking good while keeping you comfortable. The synthetic material offers optimal breathability which will keep your foot dry when out of water and light when in the water. A rubber sole makes long treks to the beach feel like nothing and balancing on rocks in the water that much easier. You won’t have to worry about ankle support as these shoes have a low top design with added support. A specially designed tongue adds extra cushion and stability that other shoes just don’t possess. A bendable heel insert gives you the best cushion for your feet possible. All of this comes in a package that is environmentally friendly made of a material that has been recycled. This is a lightweight package that will keep your feet protected and comfortable. These uniquely designed shoes have a look unlike any other on our list. Looking more like an everyday shoe than any of the others these water shoes are bound to impress. These sneakers are made with a synthetic sole and a nylon mesh and neoprene upper. These slip on shoes have a form fitting perfectly comfortable feel that will leave your feet happy even with long term use. These shoes were built for far more than just swimming through the water, they are built for adventures. Simply slip on these shoes and feel ready for anything as you navigate your way through hot sand and sharp rocks. Fitting like a glove, these shoes come in a medium width and with even more sizes you are guaranteed to find your perfect fit. The elastic cord lacing has a toggle lock system which allows you complete control to get the perfect fit with these shoes. A padded tongue and a collar on the shoe allows these shoes to add cushioning and blend to look like your typical everyday sneaker. The sole of these shoes are ultra flexible made from rubber. These soles have a wet/dry grip which means that you are protected no matter the conditions. When looking inside the shoe you will see a removable insole. This is here to provide added cushioning and shock absorption but can be removed to provide more room in the shoe for those with a wider foot. These water shoes by Northside are one of our favorites and we are sure you will think the same. The Wave is a company that makes excellent water shoes. Their attention to detail is superb and is showcased in their products. These shoes are made of a synthetic material that ensures a quick dry and comfortable layer of protection on your feet. A bargain of a price, these water shoes are an excellent choice for those with a wider foot. These water shoes for kayaking and any other water sport will make your feet thank you. Features like a studded sole allow you to climb even the slipperiest surfaces with ease. The stud tractioned bottom hugs wet and slippery surfaces and firmly plants your feet in an effort to keep you standing upright. A zipper on the top of the shoe makes it easy to slip into and is an extra measure ensuring these shoes stay on your feet. The zippered top makes slipping these shoes on and off easy making these a great option for older adults or younger kids that struggle with laces. A pull tab on the back also adds a thoughtful way of slipping these lightweight shoes on and off. Choose from eighteen unique styles to fit into your next adventure on the water. Coming in seven different sizes The Wave water shoes have the right fit for you. There are many factors to think about when purchasing the perfect pair of aqua shoes. These features should all be considered when deciding on your perfect water shoe. The bottom of the shoe is what will dictate the grip of the shoe. Some will have holes in them to let water drain while others have studs to maximize your grip. 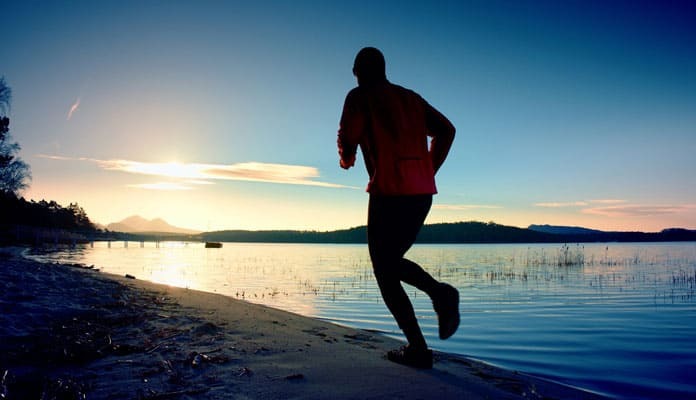 If you are swimming in bodies of water with rocky shores we recommend looking for shoes that have added grip. Rocks can get slippery and the grip will ensure you stay on your feet. Since you will be using your shoes in wet conditions it is important to get them with a quick drying material. Many synthetic fabrics will ensure your feet dry quickly and do not retain water. It is recommended to steer clear of material that will absorb water such as cotton. These will weigh you down and keep your feet wetter and may restore water for a longer period of time possibly making you uncomfortable. Being able to allow the water to escape your shoe can be a critical feature. If the shoe doesn’t allow water out your feet will get heavy and could even be pulled off your foot. Companies combat this by adding drain holes to the design. Some will have a sole that has holes in it to allow water to pass while others have actually cut holes into the material. While others use material that is porous and actually wicks water out automatically. Companies will add features which allow you to put these shoes on and take them off in almost no time. Some have an easy to use zipper while others utilize a pull tab at the heel. Being able to quickly put your shoes on will get you to the water quicker and without a struggle. This is also an excellent feature for young children. Even though these shoes are designed for the water does not mean that they have to be uncomfortable. These shoes should have padding built into the shoe that will not come loose. This could cause serious issues for you while you’re walking. Your shoe should fit comfortably and your foot should not move around. If you are going to be using these shoes for rocky shores, ensure you have enough padding so that you will not feel the sharp edges of the rocks. Now that you know the features to look for it is important to consider how you are going to be using your shoes before determining what the perfect pair for you is. Whether you are in the tropical water of the Caribbean or in the cooler water off the coast of Washington will greatly influence what type of water shoe is right for you. If you are using your shoes in colder water conditions you may not want a shoe with full mesh. Having some added protection and even insulation between your feet and the colder waters will prove invaluable. Shoes with thicker materials, such as neoprene, are recommended. Neoprene is a material that wetsuits are made of and will allow you to stay in colder water longer. 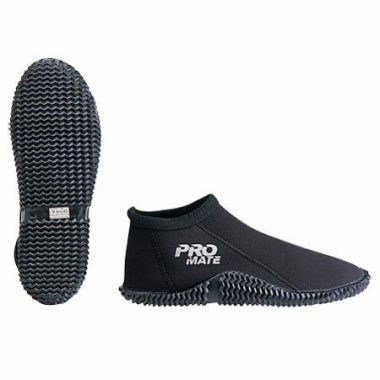 For these climates try the Promate 3mm Beach Dog Water Sports Boots Shoes. When lucky enough to be in warm tropical water you will not need the added security and protection of a cold water shoe. A simple mesh shoe that focuses on breathability is key for you. This will allow the warmer water to freely flow against your skin but protect you from the rough slippery rocks and warm sand. This thinner mesh material will come with a lightweight design that is focused on breathability and fast drying technology. We suggest looking for a shoe with air holes that allow water to pass through with ease. This will keep your feet cool and dry making your day more enjoyable. Another important factor to consider the best shoe for water is the type of activity you are doing. Some people use the best water shoes for work in positions that have you around water a lot of the time. These shoes will need to offer enough padding and support to provide comfort for an eight hour day. Others use their shoes for snorkeling or scuba diving. If this is the case, getting a shoe with a low profile design that will easily fit into fins is important. Kayaking, SUP, canoeing and swimming in the water all require the same comfortable design that secures the shoes tightly to your foot while staying comfortable enough to bend and flex. Lots of water shoe users want a well-rounded boot that will transfer between swimming, beach yoga and volleyball to a grocery store or restaurant. 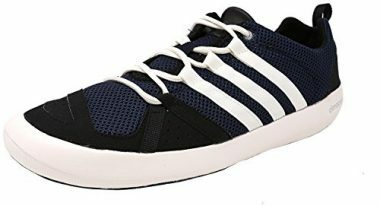 Lots of shoe companies know the importance of this and have created water shoes with a fashionable design that mirrors your average sneaker giving you an even wider range of use. For those outdoor enthusiasts that love the water, you may want to consider a pair of water shoes. These fast drying shoes come in a number of different styles depending on your intended use. With four main types of shoes to choose from you will be able to find the perfect shoes for your next day in the water. You don’t always need to have closed shoes in and around the water. Sandal water shoes are great for getting you to and from the beach. What makes these much better than regular flip flops is their thick sole. Some will also have some sort of mechanism which keeps these on your feet. This can be done through a mesh material that hugs the contours of your foot. Even though these add great protection for short walks on relatively level ground, they don’t offer enough when it comes to hiking. But with that being said, these are light enough that you can throw them in your bag to air your feet out when you find a beach. This type of water shoe is the best for all around use. Half way between sandals and running shoes, these are great go-to shoes that fit a more “one type fits all” mentality. These close toed shoes have all the benefits of a sandal design but with a proper lacing system, a mesh lining and a padded collar. The strap sandal design crosses over your foot enclosing your heel to provide a secure fit to your foot. These shoes still provide all the benefits of sandals including exceptional ventilation and drainage. Reviewers are quite pleased with the comfort of this type of shoe. Unlike sandals, these shoes offer more support and protection from both sun, sand and sharp rocks. If you are the type of person who can’t sit still, you will want active water shoes. You will be able to do all the activities you want including running, hiking, and backpacking. What makes these so great is that they are just as comfortable as traditional running shoes. They have been made out of materials that are specially designed to be lightweight while allowing water to drain through them. Most of these shoes will actually float in water which doesn’t sound like a feature you need until you’re put in a situation where it makes sense. 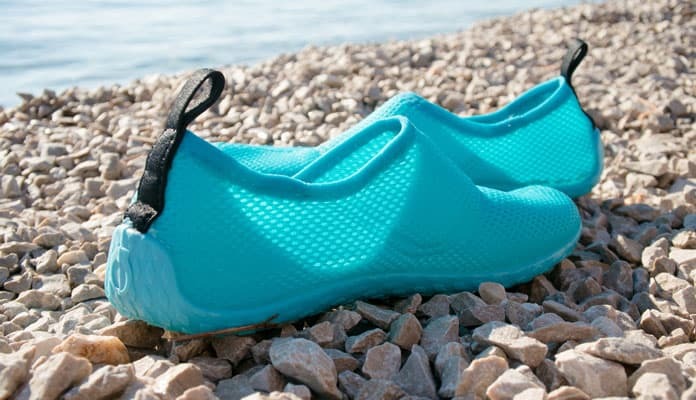 If you need the best water shoes that are the light weight while being comfortable, barefoot water shoes are what you’re looking for. These have transitioned from a trend to a staple in the shoe market. 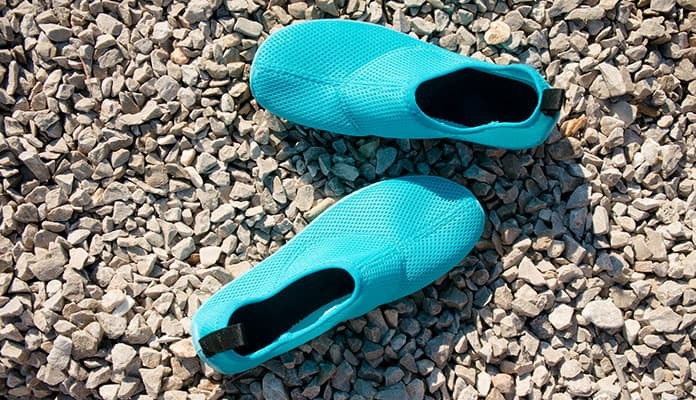 Instead of encasing your toes inside a shoe, barefoot water shoes has a spot for each individual toe. Some companies offer this type of shoe, but if you are looking to use them in wet conditions you should ensure they fall in the water shoe category. This means they will be able to be immersed in water and be able to drain the water properly. Shoes in this category typically use rubber which makes them flexible, lightweight and durable. These shoes can even be used for surfers who need the most control over their board. Despite their name, this type of water foot protection is not technically socks. Aqua socks offer more protection than their typical cotton counterpart. Water socks have many benefits with the most important being their comfort and versatility. These socks vary from having some mild traction on the sole while others utilize thick rubber for additional support. These socks are quite cushioned and are great for protecting your feet from hot sand and other potential hazards. These are ideal for the pool, the beach and in calm aquatic conditions. Many snorkelers and scuba divers use this type of foot protection as it is useful in combating blisters when using fins. When deciding on the best water shoes for you, there are lots of elements to consider. The market for aquatic foot protection is quite saturated which means that you will likely be able to be picky when choosing the best water shoes. While you may be tempted to choose a pair based on style and colors there are four more important features to consider. Most importantly you must determine your intended use. A shoe intended for hiking will be vastly different than one that is intended for lounging poolside. When using your shoes for a more adventurous water activities you may require more support. When opting for a watersport, you will likely require more flexibility and reduced bulk in your ideal water shoe. Your shoes are no good for you if they don’t stay on your feet. The best water shoes you choose should have a lacing system that not only secures them to your feet but also ensure they are comfortable. This is the outer sole of your shoe. As these are designed for aquatic use you can bet that the surfaces you stand on will be slippery. Decide on how much traction you require and then check that the amount on your shoe matches your needs. Heavy duty tread is ideal for navigating slippery rocks. A thin sole that offers more flexibility is better for pools and watersports. Once you have determined your ideal aquatic shoe type, you will want to try it on to make sure it fits you right. It is important that these are comfortable and fit your foot properly. As these shoes are intended for use in wet conditions, the chances of chafing and blistering are greatly increased. Trying the shoe on and walking in it for a bit will determine whether it is the right shoe for you. Q: When to Use Water Shoes? A: You can use water shoes in almost any situation. They are perfect for using in the water, but they can also be used on dry land too. They are great for wearing when you are participating in water sports such as kayaking. A good water shoe will provide protection to your feet while resisting the water. They are also great for activities such as fishing. They provide you with the traction you need on slippery surfaces. They are also great for hiking, especially in wetter conditions. Should you find a lake on your hike, you can also take a quick dip in the water to refresh yourself. Q: What Are The Benefits of Water Shoes? A: There are two main benefits to water shoes over regular shoes. Firstly they have thick soles to prevent anything jagged form penetrating your sole. This is great for when you are navigating rocks at the beach. They are also waterproof. They let the water in, but they also drain the water away. The benefit of the shoe being waterproof is that they do not harbor nasty bacteria which can grow and smell. Q: How To Clean Water Shoes? A: After each use, you should take the time to clean your shoes. This will wash off any debris on the shoe while dissolving any dirt and salt. If the shoes are particularly dirty, then you can soak them in some warm soapy water and then rinse them off with warm fresh water. After you rinse the shoes off, make sure to let them dry before you wear them again. To speed up the drying process, you can use a hairdryer. Q: What Are The Differences Between Regular And Water Shoes? A: Water shoes are made from waterproof materials while regular shoes are not. As the shoes are made from waterproof materials, they do not harbor the same bacteria which regular shoes would harbor if they got wet. Aqua shoes are also designed to be put on and taken off quickly. They usually are designed to slip on your shoes instead of having to tie laces. Water shoes also have a thicker sole to protect your feet from any jagged surfaces. Water shoes also have better traction on the soles. They are designed to be used in wet conditions. With regular shoes, you will get some traction, but not as much as you will with water shoes. This can be critical if you are navigating over wet rocks. Q: Can I Use The Same Water Shoes For River, Sea, and Pool? A: Yes, you can. Water shoes are made from waterproof materials which can withstand fresh and salt water. They also provide excellent traction, so they are great for walking through rivers, wading into the sea, or walking around a wet poolside. The only thing we recommend is that you wash your shoes between each use, especially if you are using your best water shoes in salt water. The best water shoes will be a combination of features that work best for you. Before you decide on a set of boots consider what kind of terrain you will be using them in most. Rockier beaches will require more padding and grip while sand will only require a little traction. Don’t forget that these are going to be used in wet environments and should have a quick drying material that ensures your feet don’t stay wet after you leave the water. These shoes are meant to make your day on the water be more comfortable and allow you to explore places you never thought possible. Having shoes that seamlessly transfer between all water activities will allow you to get the most out of your summer. If you like what on our list, you can also check our Dry Bags, Duffel Bags and a lot more. Do you have a favorite water shoe that made it on our list? Let us know how you like it in the comment section below.